Case Study: OC Alfa Romeo — Modera Inc.
Modera was hired in 2018 to help Orange Coast Auto Group with re-branding, as the dealership group expanded marketing efforts with new acquisitions (Orange Coast Acura) and new vehicle models (Orange Coast Alfa Romeo & FIAT). As a top automotive dealer group in Southern California, Orange Coast asked Modera to provide a broad set of agency services which included brand strategy, media planning, creative development, social media, and email marketing. 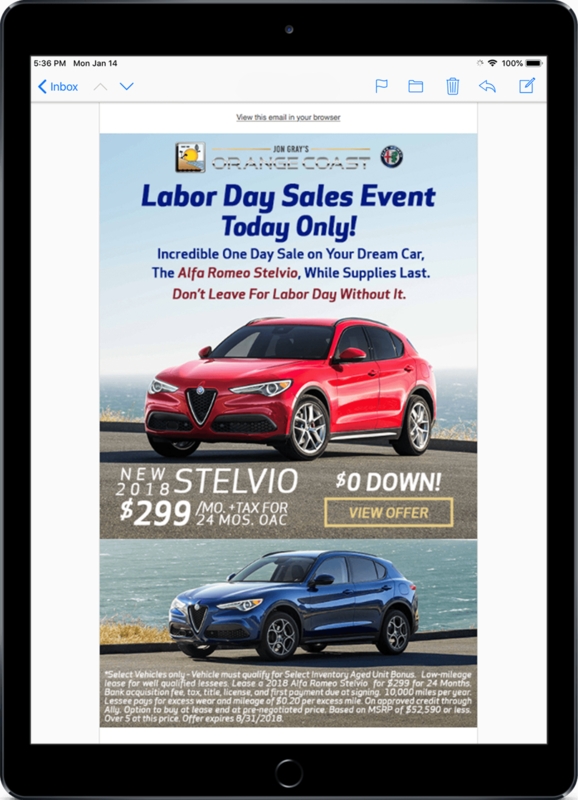 Orange Coast Alfa Romeo typically rated as a Top 5 Alfa Romeo dealer in the nation (by sales), but the dealership wanted to capitalize on the busy car-buying Labor Day Weekend. After a successful first three weeks of August 2018, Modera-run digital ads and newsletters had helped sell nearly 40 New 2018 Alfa Romeo Giulia and Stelvio models. Orange Coast learned they ranked as the #2 dealer in the nation by sales, so Modera implemented an aggressive social media and email marketing campaign on the final weekend of August, more than doubling monthly sales through the 2018 Labor Day weekend. As a result, Orange Coast Alfa Romeo beat a local area competitor to become the #1 Alfa Romeo Dealer in the US. Modera utilized Mailchimp to blast weekly specials to detailed lists segmented by customer type and vehicle interest. Although each dealership averaged three newsletters per month, Modera designed and distributed seven unique newsletters during the busy Labor Day Sales Event. The seven campaigns averaged an impressive 9% click rate and 42% open rate, more than doubling the averages for Orange Coast Alfa Romeo & FIAT. Using audience segmentation, interest groups, and re-marketing, Modera created Facebook and Instagram ads directed towards high-intent car buyers. Both Facebook and Instagram ads used striking visuals to attract potential customers, something made difficult by disclaimers, corporate compliance and 20% text rules. The entire social media campaign generated over 301K impressions with a total reach of 115K and 4.3K VDP views. Fiat Chrysler Automobiles (FCA) reported that Alfa Romeo overall sales percentage rates in August 2018 increased by 96% compared to August 2017. A majority of these sales consisted of the Alfa Romeo Stelvio, which is the same vehicle that Orange Coast Alfa Romeo nearly sold out of. Alfa Romeo Stelvio sales increased 526% from August 2017.